Most people would associate rain with sadness. This morning, it was an awesome ride in the rain. 6:18am….my ride buddy Zaldy ( https://www.facebook.com/profile.php?id=1239227771) and I took off en route to our usual mountain bike playground Monterey Hills. Skies were gray and it seems that there was a very little chance that the sun would show up. It took us 34 minutes to reach the top. We were 4 minutes OFF our usual pace. It’s probably because we were talking too much while pedaling to the top. 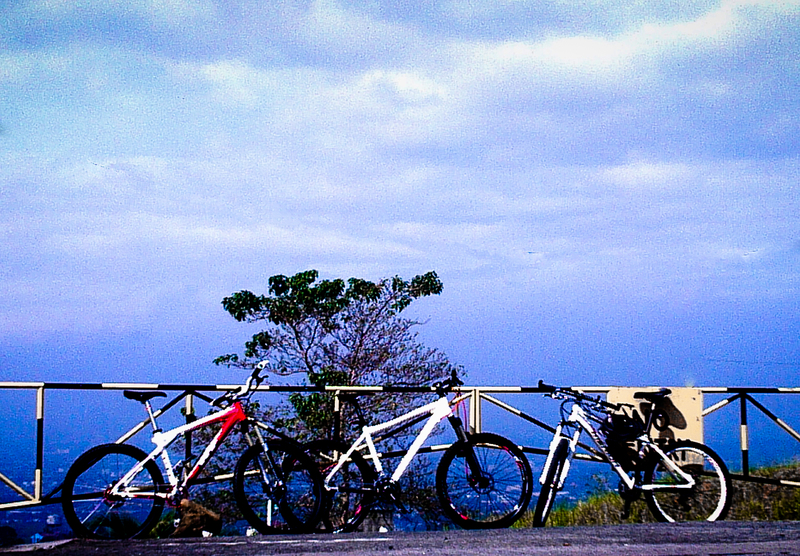 Zaldy was also too busy during this month and we didn’t get to ride together. So I guess this was time to catch up on stories. ha! ha! ha! Midway to the top, the sun did shine but very briefly. When we reached the top, the skies were darker. From where we parked, we could see the skyline disappear little by little. It started to rain. By this time, we decided to head down to lower grounds and go home. We were riding in the rain! Soaking wet as I am, I cleaned my bike, dried it up, and parked it. Took a quick shower. Now time to cook breakfast. Everyone at home was still sleeping. (Probably awake but too lazy to get up because its a weekend plus the fact that it’s bed weather). Brewed some coffee, cooked fried rice, longganisa, and macaroni soup. Ahhhh yes! nothing like a good breakfast to cap off the early morning ride in the rain. ‘Twas late but what the heck! Have alarm clocks failed you on your scheduled activity for the day? Well, mine did. Before I slept the night before, I made sure that I set my alarm clock so that I’d wake up by 6am for my 7am ride. Alarm clock……..FAIL!!!! My mobile phone rang at 7.30am. My ride buddy Ryan A. called me. Got awaken by the call. Damn it! I’m freakin’ late! Told the guys to start pedaling and I’ll just follow. They insisted that they’ll wait for me at our usual spot in front of our former school Marist School in Marikina Heights. Jumped out of my bed, started preparing (morning rituals, dress up in my cycling gear). Right before I left, I had to fill my 1.5L hydration pack with water. Whoa! Mom was preparing the usual awesome power breakfast for the weekend. Fried rice, fried eggs, tapa and longganisa (from Taal, Batangas), and brewed coffee. Awesome as it may seem, I had to skip it because I was running late. Told mom I’ll have it when I come back. Met the guys at 8:11am at the usual spot and started pedaling to our usual playground….Monterey Hills Subdivision. ‘Twas late for a morning ride (well, in our standards), but what the heck! We pedaled anyways.